New maps of Cheyenne, Ogden, Pueblo and revised maps of Colorado, Nebraska, Nevada, Utah, Wyoming, northern Kansas; Powder River Basin, Laramie Mountains, Moffat Tunnel Subdivision, Joint Line between Denver and Pueblo, Denver, Salt Lake City, and Omaha-Council Bluffs. Railroad Emergency Telephone Number list. AAR Narrowband Channel Plans, for both Analog and Digital radio communications. Completely revised Signal Aspects & Indications chart including Utah Transit Authority Frontrunner aspects. 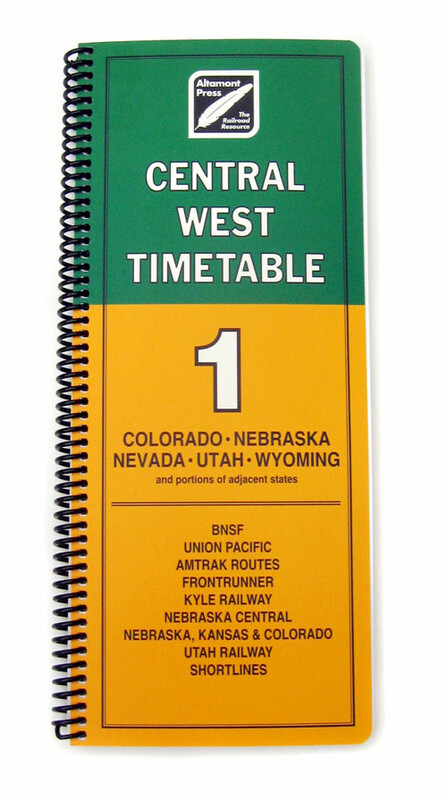 Completely revised timetable profiles, radio frequency assignments, BNSF and UP train symbol lists, and locomotive rosters. Replaces Altamont Press Rocky Mountain and Mountain Plains Region Timetables, last published in 2005 and 2001, respectively. 13,782 route miles. 41 railroads. 136 pages, spiral bound. ISBN 978-1-934455-40-1. Shipping: $2.50 - USPS First Class Mail. Add $1.00 for each additional copy. Send check or money order to: Altamont Press • PO Box 5264 • Fullerton, CA 92838. © Copyright 2012, Altamont Press Publishing Company.